One. Merry Christmas and a Happy New 2014 Year, my cherished readers! We wish you all the best in your lives now and in the future, may you find peace, tranquillity and harmony in the days to come. Treasure the moments with family, friends, colleagues and neighbours around. Life is short, so value every moment of its existence. Be happy, healthy and enjoy life. Two. Enjoy the beautiful singing of Barbra Streisand (born April 24, 1942), an American singer, songwriter, author, actress, writer, film producer, and director. “Is she great, or merely very good? Whatever you’re going to be. Whatever you are is all right with me. We take it for granted that in four minutes, using lyrics and music and her own unique vocal, temperamental, and interpretive gifts, a singer can convey character, situation, emotion, idea, analysis, morality and time, as well as melody and rhythm, but this is still a wonderful and useful accomplishment. 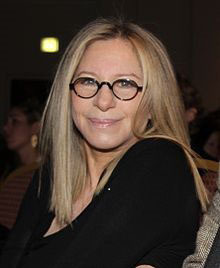 Barbra Streisand has been one of the most distinguished singers of the last time. She did ans does a lot of charity work. On the picture to the left one can see Streisand at a health conference in 2013. Isn’t she a beautiful lady in her age of 71? Three. IB Times, Tue., Dec. 17, 2013, informs that Pope Francis celebrated his 77-th birthday with homeless people. 4 homeless people – one of them with his dog – joined Pope Francis in celebration of his 77th birthday at the Vatican. Among those present at Tuesday’s Mass were Archbishop Pietro Parolin, the Secretary of State and Cardinal Angelo Sodano, the Dean of the College of Cardinals, Almoner Monsignor Konrad Krajewwski brought with him the four homeless men, who live on the streets just outside the Holy See’s walls. The Pope hosted the breakfast at St. Martha’s Residence, the Vatican hotel where he has stayed since his election; the Vatican said in a statement that the occasion was “particularly friendly”. Four. Taylor Swift, born December 13, 1989, an American singer-songwriter, donated $ 4 million US which made her the most generous celebrity of 2012. Five. Charlie Sheen (Carlos Irwin Estevez, best known by his stage name Charlie Sheen, is an American actor who starred in films: Platoon, The Wraith, Wall Street, Major League, Hot Shots! Hot Shots!, Part Deux, Scary Movies 3 etc. not only did Sheen pledge $ 1 million US to a military charity, he also donated $ 75.000 US to a ten-year-old girl with cancer.